MILLARE Fashion: Le Reve Pieces Open Its Jewellery Store Today Saturday, 27 October, 2012! Le Reve Pieces Open Its Jewellery Store Today Saturday, 27 October, 2012! Le Reve Pieces, with an exclusive selection of exquisite Jewellery for women, is celebrating the opening of the fashion retail store today at the Valley View Mall, Niyi Okunubi Street, Lekki Phase I. Le Reve, which simply means “The Dream” in French, is offering ‘Dream Pieces’; these are the rarest of pieces every woman dreams to possess. Le Reve Pieces are crafted from beautiful hand-made Jewellery made from genuine stones and high quality findings and materials that would make any woman standout. 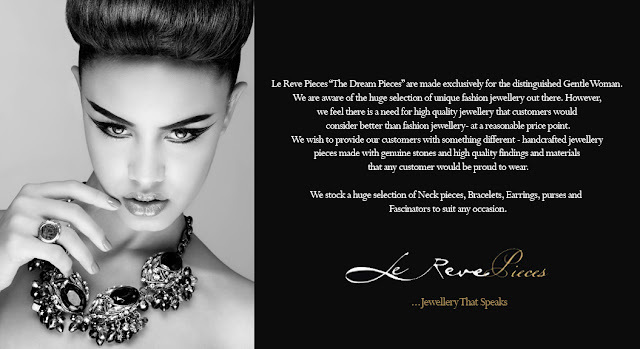 Le Reve Pieces is using this celebration to appreciate its customers by offering discounts up to 20% off fabulous Neckpieces, Bracelets, Earrings, Purses & Fascinators to suit any occasion. With drinks, music, hor d’oeuves and plenty social networking and mingling to guarantee a day of fun. Venue: Valley View Mall, Shop FF4, No 1B, Niyi Okunubi Street, Lekki Phase 1. (First Turning On Your Right From Lekki 1 Gate – Dowen Collge Road). Thanks for nice blog. SizeGenie iss your personal body scanner. Quickly and accurately take your measurements so you always get the perfect fit when buying clothes online. Body-Cloud is the creator of SizeGenie, with a Kickstarter campaign on the way aiming to change fashion shopping for good.